An 800 square foot 1 bedroom and 1 full bathroom that sleeps 6 comfortably. The bedroom offers a Queen sized bed with a custom mattress as well as an extra long twin sized bunk beds each complete with custom mattresses as well. The high-end sleeper sofa in the living also folds out into a Queen sized bed. 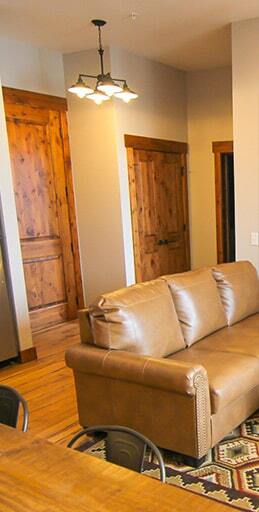 This roomy suite is accentuated with 10 feet high ceilings and a modern rustic feel with reclaimed wood furniture. Some of the amenities you’ll enjoy after a long day in Yellowstone are: full kitchen and dining area, oak wood floors, reclaimed wood furniture, HD flat screen tv and cable, free wifi, air conditioning and definitely the custom mattresses. Join us on the main level at Wonderland Cafe for our delicious baked goods and unique fare along with your favorite beers and wines.